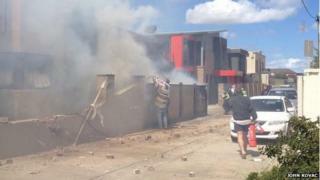 A light aircraft has crashed into a home in the city of Melbourne, Australia, killing the pilot. Witnesses said the plane, described by officials as "amateur built", had stalled and collided with the corner of a house, bursting into flames. An elderly woman inside the house was unharmed but was treated for shock by paramedics. Footage carried by Fairfax Media showed the plane had skidded down a lane, destroying the outer wall of the house. Herta Nebert, who was in her home when the plane hit it, told the Australian Broadcasting Corporation. that she heard a "tremendous roar", followed by a loud bang. "I fell on my knees because the shockwaves came straight from the window and the glass was all over the place," she said. "I think I'm a very lucky woman. I'm glad to be alive." The crash is being investigated by the Australian Transport Safety Board (ATSB), which said the plane had been "amateur built" Van's RV-6A, a two-seater plane sold in kit form. Witness John Kovac tweeted pictures of the scene, saying he had seen the plane go down. "I was watching him, all of a sudden [it] went into a dive, I thought he was doing a stunt," he said in a tweet. Another witness told The Age it had sounded "like a bomb going off". Fire and rescue officials said the pilot "did a good job" of steering clear of homes. "He's missed the power lines... and missed houses really, he's just collected a bit of the fence and pretty much guided his way down the laneway," said a spokesman from the Country Fire Authority.